Providing good services is difficult if we don't monitor how well we're doing. Fortunately, we're building an entire platform to show, compare and provide insight into how well each service is working for citizens. On every service performance dashboard we now link to the service we're monitoring. So performance/tax-disc displays a clear link to 'renew a tax disc'. The performance platform may be linking to GOV.UK pages, but up until now it hasn't had much love from the main transactional pages of GOV.UK. The platform is still an alpha project, with many kinks to iron out. But we feel it's important to start sharing this information as clearly and openly as possible to help us get better feedback. Research into the performance platform's use suggests that the current audience is locked down to the manager for the service we're monitoring. But we feel the performance of that service can only be enhanced by giving access to these statistics to as broad a range of users as possible. The visiting figures for each dashboard looked pretty slim. Our initial plan was to start linking to the performance of each service from the service start page to increase use both in volume and diversity. 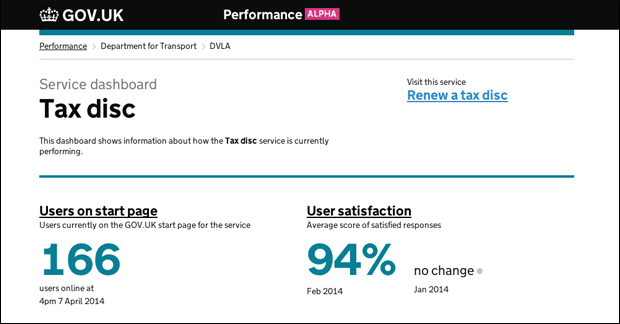 A couple of weeks ago, we added a link on the 'renew a tax disc' start page linking to the service page on the performance platform. Data shows that users don't spend much time on start pages, as they are there to complete the transaction as soon as possible. We needed to make sure it didn't get in the way for these users, but for the more inquisitive users it allowed them to see how the service was performing. So adding one small link almost doubled the use of the tax-disc performance dashboard. This tallied quite well with our assumptions: no big impact for users who want to just get on with the transaction, but lots of fresh eyes on the performance of that service. We'll continue to measure how much use the 'Find out how this service is performing' link gets on the service start page. When we have more data we'll look at adding this kind of link on more start pages. We're also looking into where users will see this link. Should it be at the beginning of a transaction, or once the transaction is finished? We already have a story to start looking at where to put the link. Just a small point but the graph image beside the "how this service is performing" looks like it should be a link. It would be better if the colour was different or also links to the same url. Great to see this starting to be exposed - there's a huge amount of potential there. It'll be interesting to see how we can provide more contextual information on the start pages. If we can begin to capture and expose things like processing times for licensing applications, that would help set peoples' expectations of how far in advance they need to apply. we hope to be testing this out as we continue our work on start pages - Guy and I will continue to blog about our learnings. I think there are plenty of things that could be better shared both on start and end pages with the user to help them figure out where they stand in relation to the service they use. I'm keen on hooking up the performance platform with the design team more often on work like this. This is really exciting. The potential is enormous. One of the things I looked at with HMRC when I was working on transition was the issues around service availability where end users of the systems, some of whom are tax agents using the services every day, are looking for service availability messages. The size, number and complexity of the systems means that services may have minor issues which only impact a small percentage of users but a high absolute number of users. Some of these service messages are planned or known issues, others are unplanned. Data for both could come from the performance platform, either generated automatically or from the service manager. Some of this data could then be exposed on start pages if there is a large enough user need. In short, if the service has a problem, let end users have a way to find out about those issues, and if major issues with the service, even disable the start button. we have a story for service downtime in our backlog https://www.pivotaltracker.com/story/show/67670800. Henry has also started thinking about service downtime appearing on the performance platform - we are hoping to link this work up. If I have missed anything - let me know.